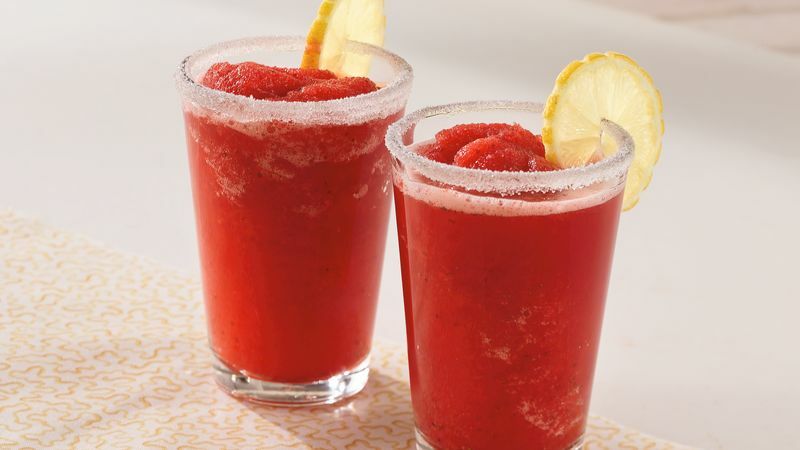 In blender, place 1/2 cup of the grape juice, 1 can lemonade and 1 bag strawberries. Cover; blend on high speed until smooth. Pour into 4-quart nonmetal container; repeat. Stir in remaining grape juice. Cover; freeze at least 4 hours, stirring occasionally. Remove container from freezer 30 minutes before serving. Just before serving, stir in carbonated beverage. Garnish as desired. This citrus-berry spritzer can be made the night before you plan to serve it. For added sparkle, dip the rims of your serving glasses in sugar and top with a fresh strawberry before adding the punch.